To achieve normal conveying during the material feeding, conveying, and discharge of a packaging process, packing equipment is often equipped with one of the following conveyors: bucket elevator conveyor, screw conveyor, horizontal conveyor, inclined belt conveyor and package conveyor. 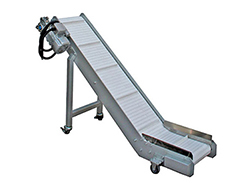 These conveyors can be combined with a weighing system and packaging machine. 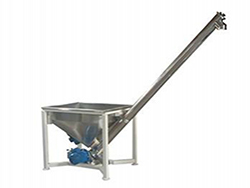 Bucket Elevator Conveyor The bucket elevator conveyor can be combined with multihead weighing and packaging machines to form an automatic quantitative packaging system. Inside the enclosed stainless steel shell, the material is conveyed via the bucket feeder, which is hung on a chain. Screw Conveyor The screw conveyor will move materials to be packaged to the weighing section of the packaging production line, and in doing so, carry out automatic material feeding. This process requires no manual operation, thus improving production efficiency. Horizontal Conveyor The horizontal conveyor is a machine used in a packaging production line. One large conveyor can be equipped with several horizontal conveyors, which will send materials to the packaging bag. The feeding quantity is customizable in a range of 15 to 20m, depending on customer requirements. Inclined Belt Conveyor The inclined belt conveyor is an elevating conveyor that moves products from one point to another. It is used to convey puffed foods, vegetables, fruits, and more. 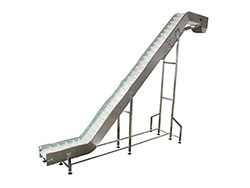 The inclined belt conveyor features a large conveying capacity and smooth flow. 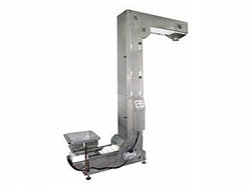 Package Conveyor The package conveyor is specifically used to transport packed bags to a predetermined height. 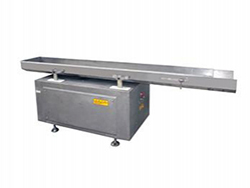 The package conveyor is a belt type conveyor that is able to be independently used. It can also achieve product conveyance when paired with a packaging machine. Shanghai Siyuan Packing Machinery Co., Ltd.